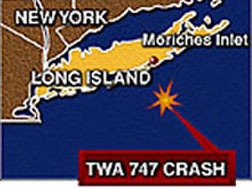 These two still frames, from a computer simulation of the crash, show the break-up of the doomed 747 in mid air. The flaming ocean debris field of the downed 747. 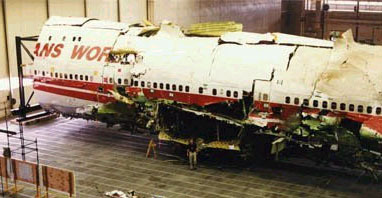 Reconstruction of the recovered pieces of the 747. 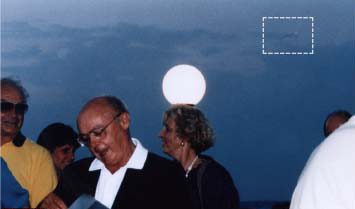 The photo on the left was taken by Linda Cabot at a party she was attending, near where the plane went down in flames. In the outlined box is what some people think is a missile in flight. The photo, next to it, is a blow-up of that image. The photo on the right, also taken at the time and in the vicinity of the plane crash, was taken by a man named Kreiger. Some people claim that this is the vapor trail left by a missile. I've added these important photos, not because I OBE saw a missile, but because I OBE saw an aircraft that emitted a heated column of light that struck the plane. Something else was sharing the skies with that doomed plane, and I know what I OBE saw. I also believe that other people witnessed some aspect of what I OBE saw and that these photos might constitute evidence of war games going on. 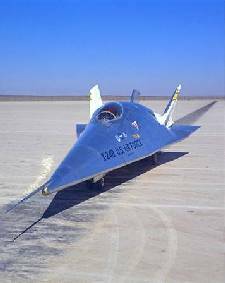 The top two photos are of the X-24B aircraft. The one on the bottom is the X-20 aircraft. I've put them here to show you that my research revealed that there were X Planes that fit the design description of what I OBE saw shoot a column of heated light that hit the 747. I'm not saying that any one of these are the planes I OBE saw, because they are not - only that the X Plane design info I received in my OBE was correct.